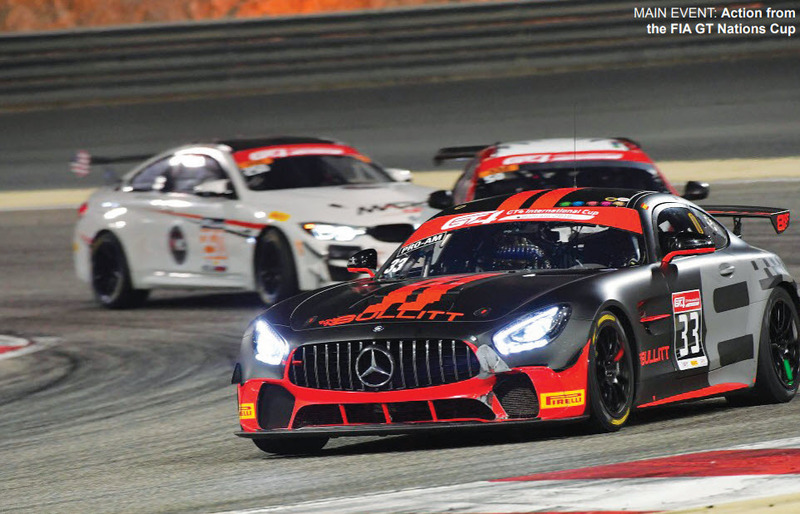 Petrolheads in the kingdom were treated to a true car-nival as the latest edition of the Bapco Bahrain GT Festival proved to be a roaring success. Over Friday and Saturday, the festival featured more than 100 cars in three categories, headlined by the new FIA GT Nations Cup. There was also the first-ever running of the SRO GT4 World Final and a stunning climax to Patrick Peter’s Classic Endurance Racing Series. Aside from the racing, there was plenty to enjoy off the track too for the thousands of motor sport fans who flocked to the Bahrain International Circuit (BIC) in Sakhir. On track, Team Turkey made headlines after becoming the first-ever winners of an FIA GT Nations Cup race, closing out the weekend with a superb victory under lights. Their victory was marked by a dazzling fireworks display to match the explosive action on the circuit. In other news, CMR won the Main Race in the GT4 International Cup, while the Bryant pair of Oliver and Grahame competing in a 1964 Shelby Cobra posted a fine double in the Bahrain Classic Challenge. The Turkish pairing of Ayhancan Guven and Salih Yuloc steered their Mercedes-AMG GT3 to the chequered flag after an eventful 27 laps around the 5.4km track. Coming away with the final podium place was the Team Denmark duo of Nicklas Nielsen and Johnny Laursen, who were 4.459s behind the winners in their own Ferrari 488 GT3. Afterwards, one scrutineer revealed that the Mexican’s Ferrari vehicle arrived late to the circuit having been held up by suspicious officials at the United States customs. There was also said to be a warm atmosphere in the paddock, with drivers particularly enjoying the opportunity to represent their country rather than just themselves or a team. After years of racing against their friends and compatriots, it was a clever change of pace. In the GT4 Main Race, CMR claimed a fantastic victory. Their No 35 Alpine A110 GT4, driven by Pierre Sancinena and Pierre-Alexandre Jean, cinched the chequered flag after 25 laps. After starting the race from way back in 18th position, CMR managed to battle to the front and eventually claim a well-deserved win. They finished the hour-long session with a 5.677s gap ahead of Phoenix Racing’s no.5 Audi R8 LMS GT4, driven by Nicolaj Moller-Madsen and Milan Dontje, who started from pole. In the other main race, Oliver and Grahame Bryant completed a perfect weekend in the Bahrain Classic Challenge. They won Race Two to complete a fantastic double after also previously topping the timesheets in Practice and Qualifying. The Bryants had earlier clinched first place from pole in the 24-lap Qualifying and were virtually unchallenged for the victory. They finished a comfortable 42.023 seconds ahead of runner-up Guillermo Fierro in Race One. Fierro, in a 1960 Maserati T61, was the runner-up once again in Race Two, while Edwin Stucky and Ludovic Cholley sharing the duties in a 1964 Shelby Cobra Daytona completed the podium placers in third. They were 1m 48.311s off the winners’ pace. The Bahrain Classic Challenge was held in co-operation with Patrick Peter’s Sixties Endurance Racing Series, which is a popular category featuring iconic machines and usually only found at Europe’s premier venues. There was an array of acts to keep young children engaged, while everyone was left in awe by a series of thrilling performances, chief amongst which was the exciting Monster Truck Show. This was worth the entrance fee alone, with the drivers showing all of their 60 years of combined experience as they did jumps and stunts over parked cars … or simply drove straight over them. The local scrapyard should be making a killing this week! Also wowing audiences was the Stannage International Stunt Team, who flipped, twirled and drifted their way into the hearts of onlookers as they brought their death-defying tricks to the kingdom with lashings of pyrotechnics. After being a big hit earlier in the year at the Formula One, the Suspended Catch Air Device (SCAD) Freefall returned to offer thrills and spills … quite literally. It’s the only system in the world that allows you to drop unattached and in a controlled free-fall. The rider gets to the release point at 50m high by using a winch via cage to the top. The SCAD jump master activates a descend system and releases the diver after a countdown, after which there is an unattached freefall. Another brilliant act was Maple Staplegun. Armed with hula hoops, office items and a quirky attitude, Maple amazed with manipulations mixed with absurd improvisations and physical comedy. After the fans had left the circuit and the cars were being packed away for shipping, the BIC’s chief executive Shaikh Salman bin Isa Al Khalifa expressed his delight at the success of the festival.